It&apos;s an easy-to-use water bottle and made of food-grade silicone and PP material. The perfect travel accessory for your next trip, the water bottle collapses small enough to fit into your travel bag or pocket. Made of pure food grade silicone, safe for drinking. Non-toxic harmless, healthy, environmentally friendly, without any smell. Wear-resistant, drop-resistant, could stand temperature from 230 degrees to -40 degrees. 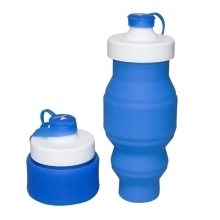 Foldable and portable design, make it a convenient sports silicone water bottle. When the bottle is fully stretched, it can hold at least 530ML of water. Reusable, recyclable and carbonated water-Friendly. Easy to clean, with soft bottle brushes or rub the bottle with hands and rinse with water. Compact and small size, can be easily put in you bag, good for outdoor and travel.